Highlighting the natural reginement of nature's most stunning raw materials--thing ancient quarries and intricate shells--the Elements Collection is the perfect marriage of opulent and organic. I have mixed feelings about this. 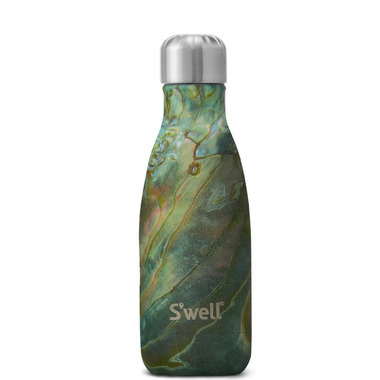 The photos for the 9 and 17 oz version of Abalone show a bottle with vividly contrasting colours. The one I got is muted in tone and colour, with no areas of deep contrast. Furthermore, the finish is matte, not high-gloss (which youâ€™d expect for a shiny material like abalone?). In short, it's rather drab -- not what I expected from the photo. Otherwise, it's a great bottle! Itâ€™s ideal to tote in a handbag, it's less tippy than the larger sizes, and it's easy to drink from. When closed, it wonâ€™t leak even if it's turned upside down. The narrow mouth only allows smaller ice cubes, but that's not a big issue. And this design IS growing on me. I still can't see it as abalone (because abalone is SHINY, and this isn't), but it does resemble unpolished dark marble. Seen like that, itâ€™s rather pretty. I just hope S'well reissues this design with a shiny high-gloss finish, like the White and Opal Marble versions in the same Elements line.